I’m now in transit. Currently sitting in my parents’ house in Wales, where we’ve just had an early Christmas get-together. I left Edinburgh on Monday and fly to Bangalore on Thursday. The past couple of weeks have been a bit of a rollercoaster-ride… lots of finishing off to do, people to see, drinks to drink, and the occasional panic attack and serious second thoughts. Clearing out my flat turned out to be way, way harder than I thought it would be. At some point several weeks ago I made the decision to cancel the storage unit I had booked back in October. Rather than spending 1400 pounds on storing all my stuff for 2 years, it seemed sensible to get rid of everything and then buy things later if I really needed them. 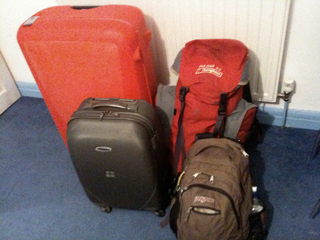 I blithely announced to the world that I would be reducing my possessions down to a single suitcase. I sold loads of stuff on eBay, had a stall on a flea market, and gave away all my furniture to friends. And then when I started to clear out in earnest, only 3-4 days ago, I started discovering all kinds of non-replaceable stuff. Things I’d designed and built at college. Obscure gadgets and tools. CDs and demos by friends and things I’d done myself. Important documents. A couple of boxes of old photos. Loads of old hard drives with maybe-interesting work and stuff on them. Of course, hard drives can be archived, photos can be scanned and CDs can be ripped, but all of this involves making decisions and taking the time to do it, and I didn’t have enough time… which as I discovered is a great way to induce blind panic. In the end a lot of stuff went in the bin or the recycling, and van-owning friends came to my rescue in helping me donate most of what was left to charity shops. Isi, Oli and Marcus were absolute life-savers — I can’t thank you enough guys! When I moved into that flat over 2 years ago, I hired a guy with a van to help me move, and the van was totally full. A whole transit van-load, and I decided that somehow I could whittle that down to a large suitcase. In a few days. Big mistake. Lesson learned. Now I’m out the other side and the panic has subsided, with just my aching limbs to remind me of the physical and emotional intensity of the weekend. I’m glad that there are bits of my life spread all over Edinburgh, because the physical connections somehow cement the emotional ties, or at least act as a marker for them. I’ve met some amazing people and made some very dear friends over the past 12 years, and leaving the place has been really really hard. Still, I feel like I haven’t really left yet, because I haven’t arrived at my destination. Still in transit.